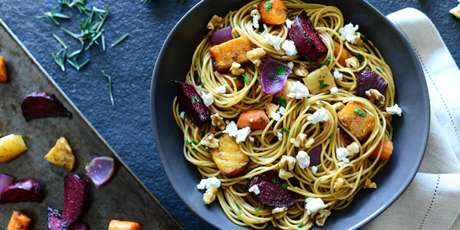 This hearty whole wheat spaghetti recipe uses delicious autumn root vegetables for a nutritious and filling meal. Courtesy of Amanda Riva of The Hot Plate. 2. Whisk oil with vinegar, mustard, honey, garlic, rosemary, salt and pepper. Measure out half and set aside. 3. Toss remaining with carrots, parsnips, red onion and squash. Arrange on a foil-lined tray. Add beets to the same boil and toss until evenly coated in the residual oil mixture. Arrange on one side of the baking sheet. Roast, tossing occasionally, for 45 minutes or until tender. 4. Meanwhile, prepare spaghetti according to package directions. Reserve 1 cup cooking liquid and drain well. 5. Toss with reserved oil mixture and as much of the cooking liquid need to achieve desired consistency. Garnish with goat cheese and walnuts.